It’s the mantra of The Legal Genealogist. Repeated over and over until long-time readers and conference goers can chant it along with me. And not just the law in general, but the law at the exact time and in the exact place where the record was created. And so as I am preparing for this weekend’s Annual Fall Conference of the Iowa Genealogical Society, in Pleasant Hill, I was pleased (and a little jealous, considering some of my research locations) to see how very easy it is to find historical laws from the Hawkeye State. • Codes are the result of the process of codification: the “process of collecting and arranging the laws of a country or state into a code, i.e., into a complete system of positive law, scientifically ordered, and promulgated by legislative authority.”2 A codification of the laws — called compiled laws or codes or revised laws or whatever term is used in the particular jurisdiction — puts all of the related laws on one topic in one place so they can be more easily consulted and understood. Finding both in Iowa is a fairly easy thing. 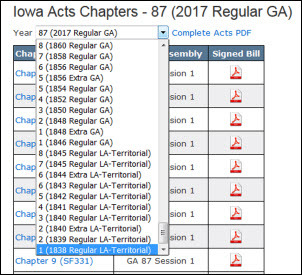 Those first session laws — and every other session law ever passed in Iowa right up to the Laws of 2017 — can be found on the Iowa Acts Archive of the Iowa Legislature. Drop down the menu at the top the way you see on the image here and you’ll get every single session of the legislature, regular and special, all the way back to 1838, and within each session you can choose to look at the entire volume or each chapter law individually. The codes are no more complicated than that, despite the fact that 19th-century Iowa recodified its territorial laws in 1843 and its state laws in 1851, 1860, 1873, 1880 (Miller and McClain), and 1897 — and continued to codify right into the 20th century. That’s because Iowa offers one-stop-shopping for these codifications as well. Check out the Iowa Code Archive of the Iowa Legislature and you’ll get a click-through link to a downloadable PDF of every single version of the code starting with the 1839 Iowa Statute Laws and coming forward through all of the codes you might need. • The 1851 Code is online at Hathitrust. • The 1873 Code can be found at Hathitrust. • The Miller code of 1880 is online at Google Books. So… no excuses for Iowa researchers. To understand the records, we have to understand the law… and Iowa makes it really easy to find the laws we need. Did New York have community property laws in 1832? My ancestor has no record of a burial,[probably buried on the farm], no local newspapers, left many small children and a wife. They could have been tenants on a land grant in Delaware County, New York. Cannot find probate, guardianship, sale of property,or death certificate. He was a farmer. Have hit a dead end. The family left the area near Stamford, NY in 1850. I found the widowed wife and children in Buffalo in 1850. No. By then NY had transitioned fully from Dutch law to common law. You can find the NY statutes online thru the NY State Library website. Your info on Iowa law resources came at just the right time. I was researching my 2nd ggrandmother’s marriage in Jefferson Co. in January 1846. The Iowa Acts Archive had what I needed: Laws of the Territory of Iowa, 1839, Chapter 25, “An act regulating marriages.” Thank you!